Wow! 2018 was another big year for the Natural Areas Stewardship program. We completed botanical inventories of several small parcels. The Land Preservation Millage was renewed for another 10-year term. Major invasive shrub control projects began at Bear Creek Nature Park, Blue Heron Environmental Area, Charles Ilsley Park, Paint Creek Heritage Area – Wet Prairie, and Stony Creek Ravine Nature Park. Volunteers monitored vernal pools, lakes, and nest boxes. Our fire crew gained experience and was able to complete several burns in the spring. Our planted prairies from 2015 really started to look like prairies in 2018. And the word continued to spread about our natural areas stewardship program and the wonderful, consistent support from our township residents. What fun! Check out the highlights of the year below, or read the full 2018 Annual Stewardship Report. (Click link to view). The table of contents in the PDF is hyperlinked to help you navigate the report. Volunteers contributed 1212 hours in 2018! Weekly bird walks continued, gathering useful data about avian life in the park and engaging residents. Volunteer workdays focused on garlic mustard (May), invasive shrub control (July to November), and seed collecting (October). Volunteers also monitored nest boxes at Draper Twin Lake Park, Charles Ilsley Park, and the Paint Creek Trail; monitored vernal pools at Bear Creek Nature Park; and monitored water quality at Lost Lake and Twin Lake. We had fun at summer and winter potlucks and the December birder coffee hour! Volunteers in various stages of seed cleaning in December 2018. The nest box monitoring program was made possible by volunteer Tom Korb, who built, helped install, and Charles Ilsley Park, Draper Twin Lake Park, and the Paint Creek Trail. We enjoyed watching bluebirds and tree swallows nesting in these new boxes! After planting 55 acres of prairie reconstructions in 2015 and 2016, we completed our third round of plantings in 2018. Using our second Partners grant, we planted an additional 15 acres at Charles Ilsley Park and 3 acres at Gallagher Creek Park in May 2018. We continued maintenance of areas planted in 2015 and 2016, working to give native plants the upper hand during the critical establishment phase. Eastern Prairie at Charles Isley Park on July 12, 2018. We contracted with Plantwise LLC for spring burns at Cranberry Lake Park(40.4 ac), Lost Lake Nature Park (24.6 ac), and Paint Creek Heritage Area—Wet Prairie (9 ac). We also worked with private landowners to burn 13.1 acres of habitat adjacent to the Paint Creek Trail right-of-way, including high quality oak savanna, prairie remnants, and fen wetland. We held volunteer prescribed burn crew training again in February. The volunteer crew completed burns at Bear Creek Nature Park (23 ac), Charles Ilsley Park (1 ac), Draper Twin Lake Park (9.4 ac), Watershed Ridge Park (2.4 ac), and Paint Creek Trail at Gunn Road (0.4 ac). Volunteers assist with a prescribed burn at Bear Creek Nature Park in April 2018. 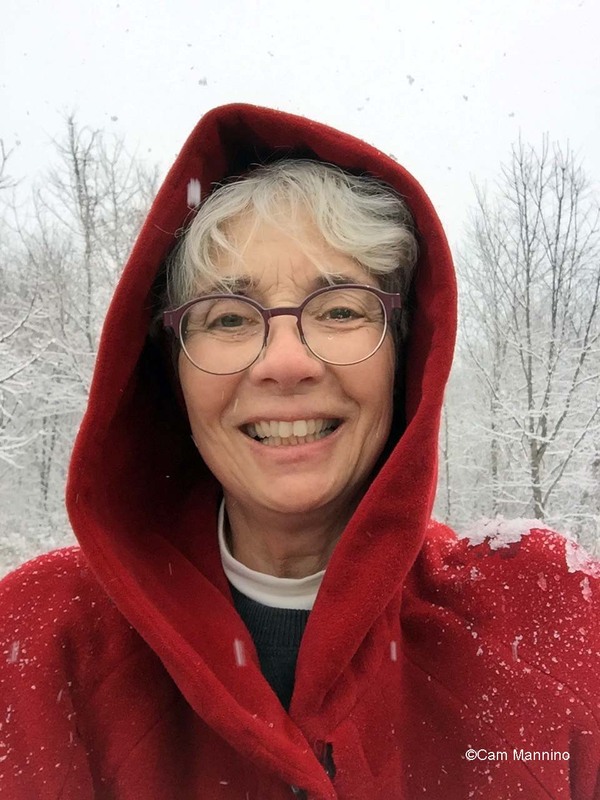 The stewardship blog continued to thrive, with regular posts from Cam Mannino. She regularly highlighted cool features across all of our parks, all with excellent writing and photographs. The blog also continued to serve as an up-to-date source of information about stewardship volunteer opportunities and events. We published 45 posts and had 6233 visitors, with 11,744 page views. Stewardship talks included presentations on native bees, rain gardens, prescribed fire, emerging invasive species, bird nest box monitoring, and oak wilt. We enjoyed a pleasant April evening at our annual Woodcock Watch at Cranberry Lake Park. Sarah (right) and Cam exploring nature at Charles Ilsley Park, August 15, 2018. We continued the Phragmites Outreach Program to help township residents get Phragmites treated on their property. We received about 32 requests for no-obligation cost estimates, and treated about 25 properties with a contractor, PLM Lake and Land Management. Phragmites does not recognize property boundaries! Catch your Phragmites while it is small and easy to control for the best results. Billy Gibala returned to our crew through June. He graduated from University of Michigan-Flint in 2017 with a degree in wildlife biology and minors in regional and urban planning, We welcomed Alyssa Radzwion to the crew. She graduated from Oakland University in December 2016 with a Bachelor’s degree in biology, and had previous experience working for the Michigan DNR stewardship crew. Katlyn Hilmer recently graduated from State University of New York College of Environmental Science and Forestry, where she focused on forestry work. Sarah Rosche joined the crew in July after completing her Master’s, studying the effects of fire on Northern Bobwhite nesting ecology and habitat selection. We had a great crew with diverse experiences! 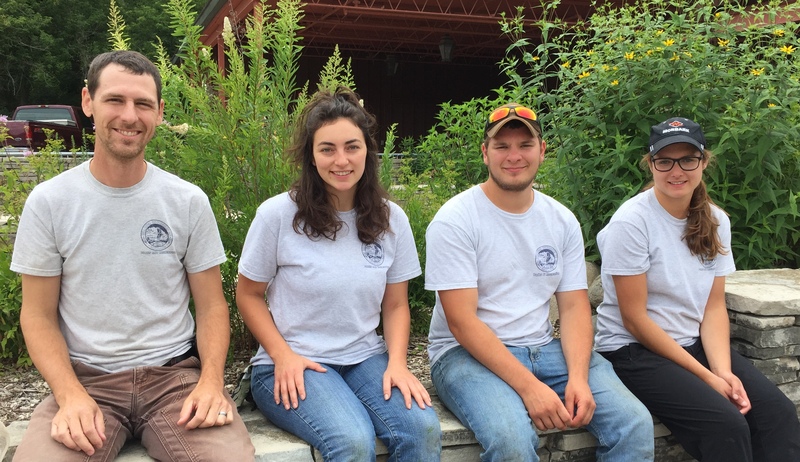 2018 Stewardship Crew (L-R): Ben VanderWeide, Alex Kriebel, Katlyn Hilmer, Billy Gibala, and Alyssa Radzwion. Sarah Rosche is not pictured. Photo by Carol Kasprzak. All of our annual reports can be found on the About page. After three years of consistent stewardship work in key project areas, we are beginning to see good results. 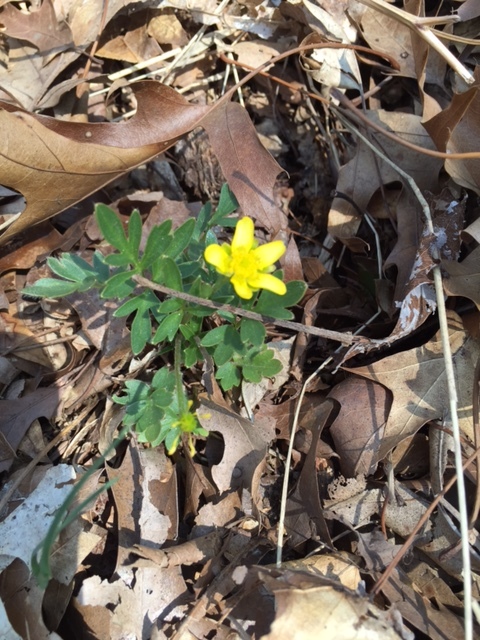 New wildflower species were found at the Wet Prairie along the Paint Creek Trail. Invasive shrubs were cleared from over 20 acres at Watershed Ridge Park and Stony Creek Ravine Nature Park. Prairie species planted a few years ago at Draper Twin Lake Park and Charles Ilsley Park began to flower. And more people like you got involved in the adventure through bird walks, volunteer workdays, nest boxes, potlucks, and stewardship talks. What fun! Check out the highlights of the year below, or read the full 2017 Annual Stewardship Report (click link to view). Volunteers contributed 637 hours in 2017! Weekly bird walks were well attended. For the first time we hosted a summer stewardship potluck to help build our conservation community. Volunteer workdays focused on garlic mustard (May), invasive shrub control (July to November), and seed collecting (October). Volunteers also helped with maintenance of native plant gardens, prescribed fire, vernal pool monitoring, and building nest boxes. Students from Eagle Creek Academy helped us install native trees and shrubs at Gallagher Creek Park. Volunteer Tom Korb led the effort to revitalize nest boxes in our parks. Tom built nearly 30 nest boxes for installation at Charles Ilsley Park and Draper Twin Lake Park. We hope to see more breeding bluebirds, kestrels, and other cavity-nesting birds in our parks in the future! Volunteer Tom Korb led the design, construction of nest boxes for Charles Ilsley Park and Draper Twin Lake Park. Nest boxes will be installed and monitored in 2018. Using our second Partners grant we prepared sites for planting 15 acres of native prairie plants at Charles Ilsley Park and 3 acres at Gallagher Creek Park. Planting was delayed until spring 2018 due to seed shortages, but that will give us a little more time to get the site in good shape. We continued maintenance of areas planted in 2015 and 2016, working to give native plants the upper hand during the critical establishment phase. Native plants in newly planted fields at Charles Ilsley Park provide habitat for wildlife and pollinators. We contracted with Plantwise LLC for spring burns at Cranberry Lake Park, Lost Lake Nature Park, and Marsh View Park. We also worked with private landowners to burn habitat adjacent to the Paint Creek Trail right-of-way, including high quality oak savanna, prairie remnants, and fen wetland. We held volunteer prescribed burn crew training again in February. The volunteer crew completed burns at Marsh View Park, Paint Creek Heritage Area—Wet Prairie, and the Art Project prairie north of Gallagher Road along the Paint Creek Trail. The volunteer prescribed fire crew is all smiles after a successful burn at the Paint Creek Heritage Area – Wet Prairie, Spring 2017. Photo by Sue Greenlee. Stewardship hosted education events in early 2017. Topics included the importance of protecting public land in Michigan, reptiles and amphibians of Michigan, and prescribed fire in Oakland Township parks. David Mifsud leads a presentation about Michigan reptiles and amphibians, including the eastern massasauga rattlesnake. We continued the Phragmites Outreach Program to help township residents get Phragmites treated on their property. We received about 33 requests for no-obligation cost estimates, and treated about 21 properties with a contractor, PLM Lake and Land Management. Photo monitoring is used to track the success of Phragmites treatment. This photo point at Gallagher Creek Park shows Phragmites growing thick on the edge of Silver Bell Road before the treatment program began. Photo point GCP03. August 28, 2014. We had one technician return for 2017, Zach Peklo. Zach came to us from Grand Valley State University studying natural resources management with an emphasis on Geographic Information Systems. New to our crew as seasonal land stewardship technicians in 2017 were Josh Auyer and Billy Gibala. Josh graduated from Calvin College in May 2017 with a degree in Biology. Billy graduated from University of Michigan – Flint in spring 2017 with a degree in wildlife biology and a minor in regional and urban planning. 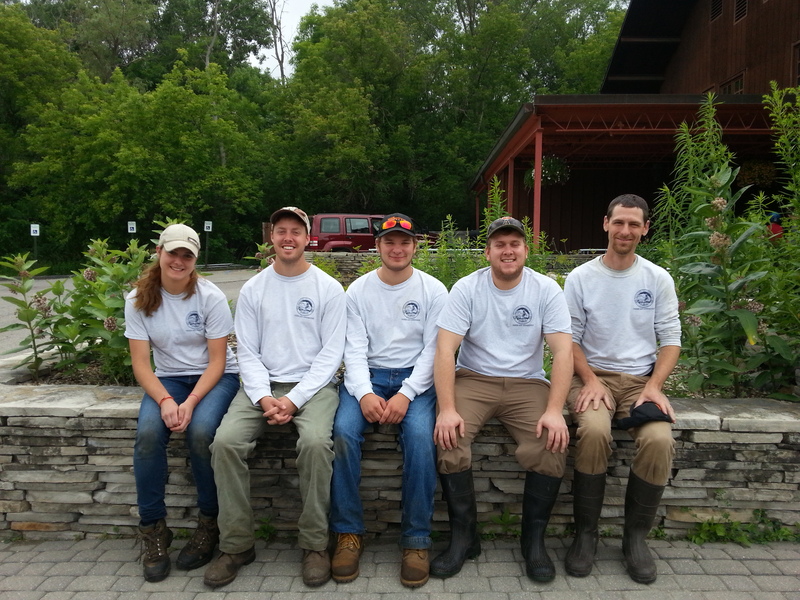 Alex Kriebel also returned to our crew as a Stewardship Specialist, bringing additional experience in natural areas management from his work with Oakland County Parks and Recreation. (L-R) Ben, Zach, Alex, Josh, and Billy, our 2017 natural areas stewardship team. It was our privilege to again steward the natural areas of Oakland Township’s beautiful parks in 2016. 2017 is shaping up to be another exciting year! Check out the highlights of the year below, or read the full 2016 Annual Stewardship Report (click link to view). We had two technicians return for 2016, Andrea Nadjarian and Zach Peklo. Andrea Nadjarian came to us from Grand Valley State University where she is pursuing a degree in natural resources management and minor in biology. Zach Peklo also comes to us from Grand Valley State University studying natural resources management with an emphasis on Geographic Information Systems. New to our crew this year was Heather Herndon, from New Mexico State where she completed her bachelor’s degree in wildlife science and a minor in range science in May 2016. 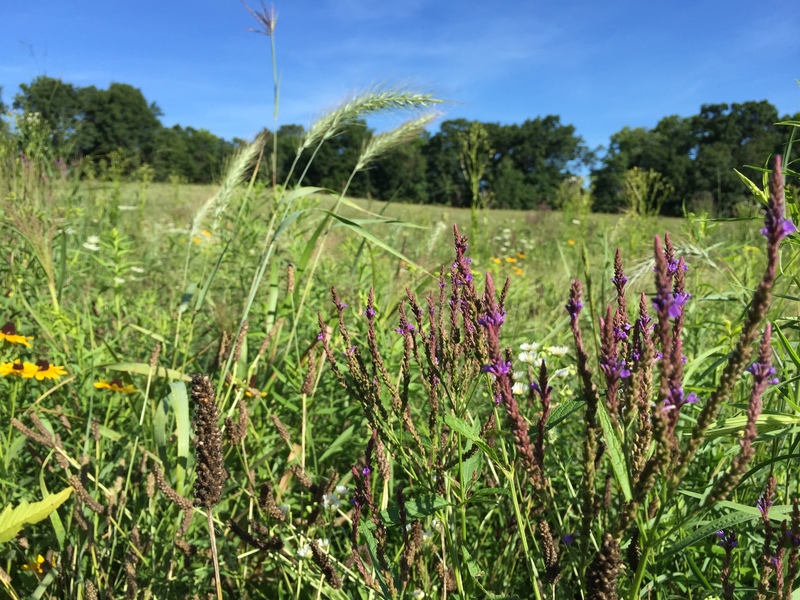 Using our second Partners grant we planted 15 acres of native prairie plants at Charles Ilsley Park and 2 acres at Gallagher Creek Park in 2016. Planting an additional 15 acres at Charles Ilsley Park and 3 acres at Gallagher Creek Park is scheduled for 2017, with preparation beginning in 2016. After planting 20 acres of native prairie species at Draper Twin Lake Park and 18 acres at Charles Ilsley Park in 2015, we completed two maintenance mows to control annual weeds. Work continued on the 2008 WHIP grant, controlling woody invasives on 33 acres of oak forest, prairie, and wetland between Gunn Rd and Adams Rd on the Paint Creek Trail. Prairie buttercup found in restoration area along the Paint Creek Trail. Oakland Township Parks and Recreation officially joined the OC CISMA. We participated in the Michigan Invasive Species Grant awarded to the OC CISMA and were able to complete treatment of approximately 42,000 linear feet of Phragmites, Japanese knotweed, and swallow-wort infestations in the right-of-way of major roads in Oakland Township. The OC CISMA is a partnership-based management structure that coordinates the invasive species control activities of its members within the geographic boundaries of Oakland County. We contracted with Plantwise LLC for spring burns at Gallagher Creek Park, Nicholson Prairie, Kamin Easement, Paint Creek Heritage Area Wet Prairie, Paint Creek Heritage Area Fen, and some Paint Creek Trail right-of-way. We contracted with Mike Appel Environmental Designs for a burn at Lost Lake Nature Park. 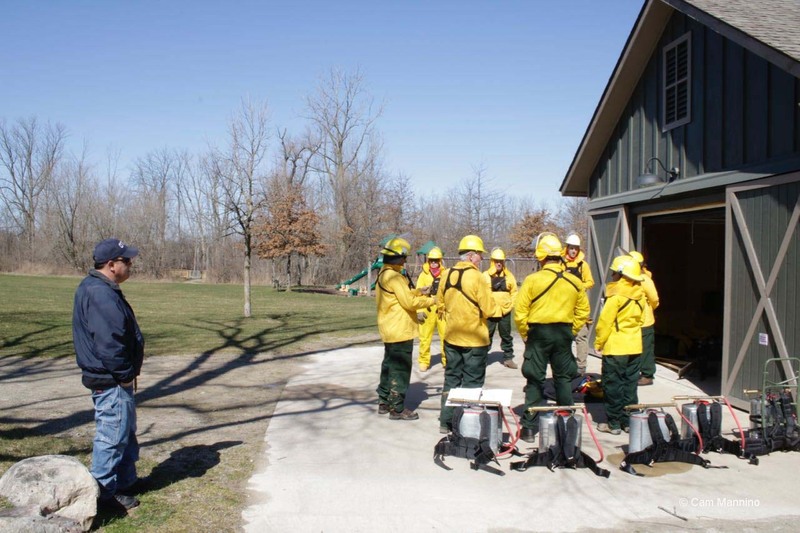 After years of planning, we held volunteer prescribed burn crew training in February and completed burns at Bear Creek Nature Park, Blue Heron Environmental Area, Marsh View Park, and the Art Project prairie at the Gallagher Road parking lot along the Paint Creek Trail. Volunteer fire crew preparing to burn, March 2016. Volunteers contributed 747 hours in 2016! Weekly bird walks continued, gathering useful data about avian life in the park and engaging residents. Volunteer workdays focused on garlic mustard (May), invasive shrub control (July to November), and seed collecting (October). Removing garlic mustard at Bear Creek Nature Park, May 2016. Stewardship hosted education events in early 2016. Topics included presentations on coyotes, the Oak Openings region in northwest Ohio, and prescribed fire in Oakland Township parks. We continued the Phragmites Outreach Program to help township residents get Phragmites treated on their property. We received about 21 requests for no-obligation cost estimates, and treated about 15 properties with a contractor, PLM Lake and Land Management. 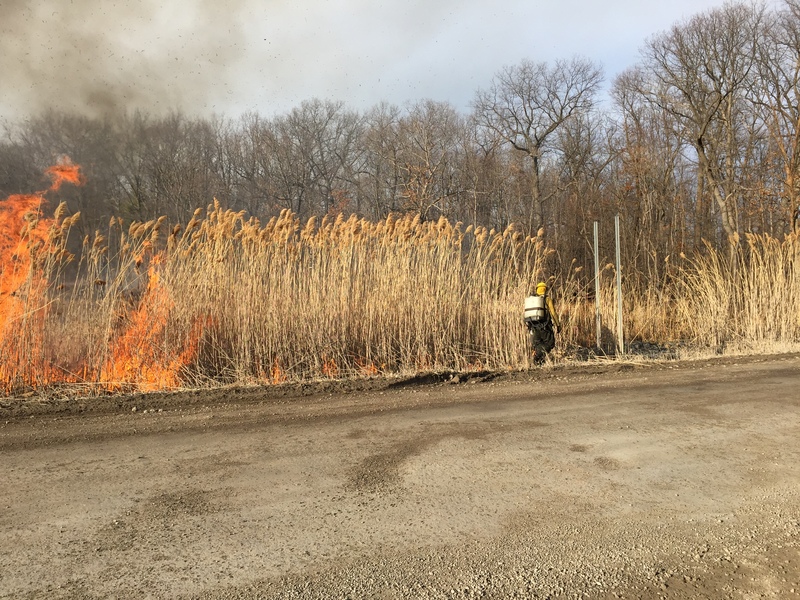 Using controlled burning to remove dead Phragmites that was treated in fall 2014. Burning will not kill Phragmites! We removed the dead thatch to allow native plants to grow again. As we look forward to our natural areas stewardship goals for 2016, we look back at what we accomplished in 2015. It was an exciting year! Check out the highlights of the year below, or read the full 2015 Annual Stewardship Report (click the link). Seasonal Technicians: We had another outstanding crew in 2015. David Vecellio was just finishing his degree at Oakland University and used the position as his required internship. Andrea Nadjarian came to us from Grand Valley State University where she is pursuing a degree in natural resources. Weston Hillier graduated from Western Michigan University in 2014. He has interests in pollinators. We also shared Zach Peklo with Six Rivers Land Conservancy to implement outreach activities for neighbors of parks with conservation easements. Andrea, Weston, Zach, David, and Ben. 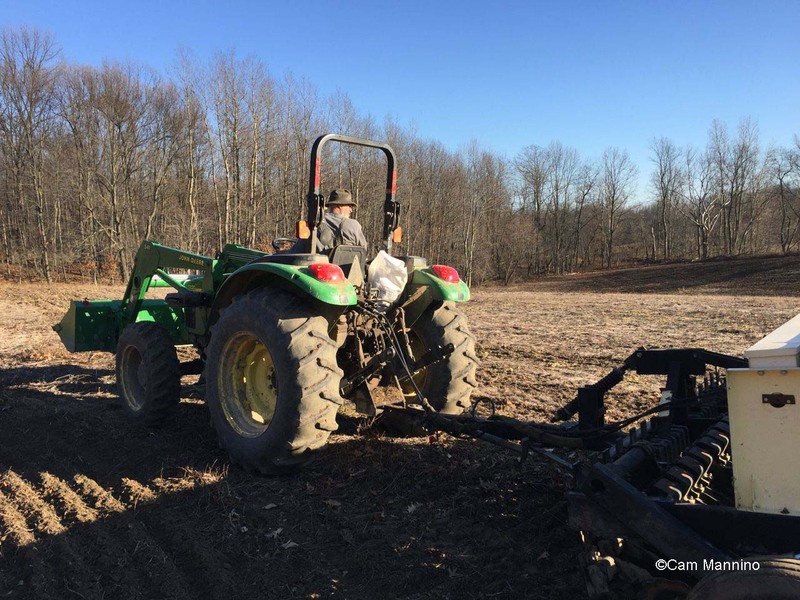 US Fish and Wildlife Service Partners for Fish and Wildlife Grants: We completed site preparation and planting for the 20 acres at Draper Twin Lake Park and 18 acres at Charles Ilsley Park. Jerry Stewart with Native Connections did the planting. We also obtained a second Partners grant to continue restoration on 30 additional acres at Charles Ilsley Park and begin restoration on 5 acres of Gallagher Creek Park uplands. USDA Wildlife Habitat Incentives Program (WHIP) grant: Work continued on the 2008 WHIP grant, controlling woody invasives on a 5 acre area adjacent to the Gallagher Road parking lot along the Paint Creek Trail. A nice prairie remnant is located at this parking lot, so restoration on adjacent private lands should provide a nice buffer. 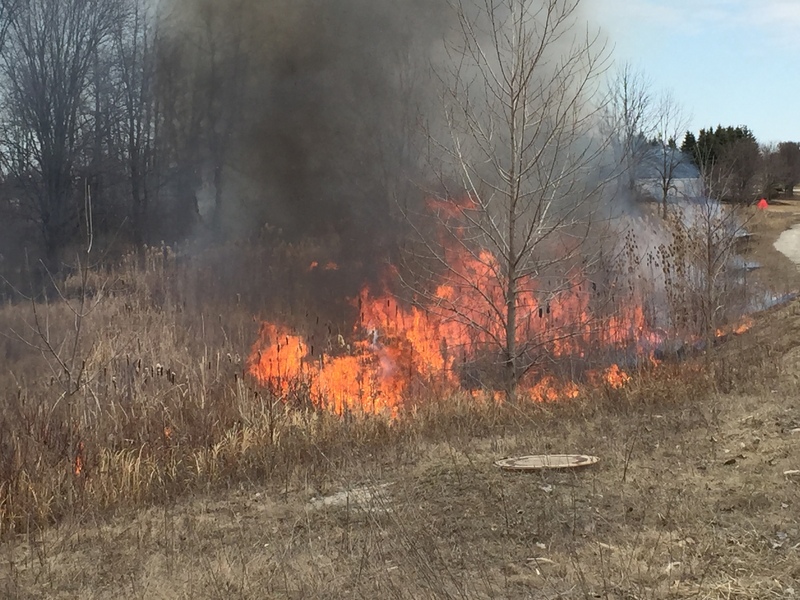 Prescribed Burns: We completed spring burns at Bear Creek Nature Park, Charles Ilsley Park, Lost Lake Nature Park, Gallagher Creek Park, O’Connor Nature Park, Paint Creek Heritage Area—Fen and Watershed Ridge Park. A primary objective of burns was removal of Phragmites thatch from areas treated in 2014. After years of planning, we also began implementation of the volunteer prescribed burn crew. We met with folks at Ann Arbor Natural Areas Preservation to learn about their program. We also held our first volunteer training on December 12. Volunteer Program: The volunteer program continued to mature. 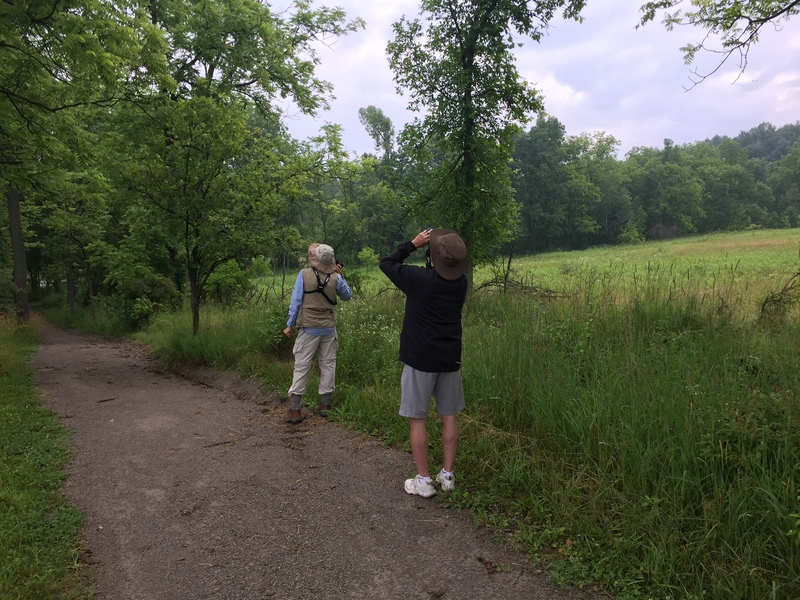 Weekly bird walks allowed the Stewardship Manager to regularly meet interested residents and recruit volunteers. We began to implement the Park Stewards program to work with highly motivated volunteers who will help look after natural areas in parks. Volunteer workdays focused on garlic mustard (May), invasive shrub control (July to November), and seed collecting (October). Education Events: Stewardship hosted education events in early 2015. Topics included a presentation on the role of fire in natural communities, and a second presentation about prairies, oak barrens, and other grasslands in Oakland Township. Phragmites Outreach Program: We launched the Phragmites Outreach Program to help township residents get Phragmites treated on their property. We received about 20 requests for no-obligation cost estimates, and treated about 12 properties with a contractor. You can find this report and the 2014 report on the “About” page. 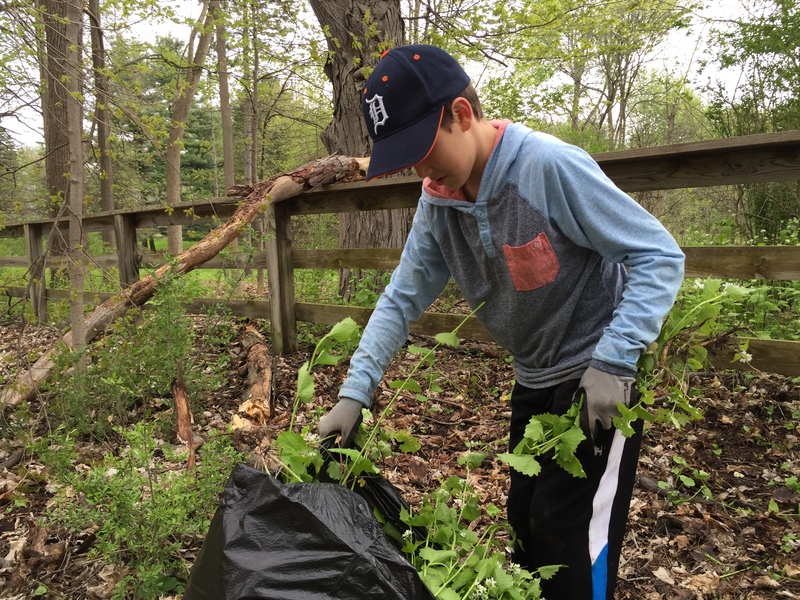 The Oakland Township Parks stewardship program had an extraordinary year in 2015. It was a year of growth, both here on the Natural Areas Notebook and for our capacity to do habitat restoration. Whether you’ve been following the Natural Areas Notebook from the first blog post or just found us, you might have missed some of these milestones from 2015. If you had a favorite memory from this blog in 2015, please share it in the comments below! Remember the deep snow and frigid temperatures last winter? We launched our weekly bird walks in the depths of winter, breaking cabin fever (and getting some pictures of spectacular winter scenes too). We had a great fun observing the mosaic of bird life change with the seasons. Join us when we start again in January! Why are we planting prairie in Michigan? What is prescribed fire? What are invasive species? How do we control Phragmites? What does it look like to landscape with native plants? Through Stewardship Talks, Phragmites Control Workshops, and Volunteer Workdays we learned together how to appreciate, protect, and restore our natural heritage. 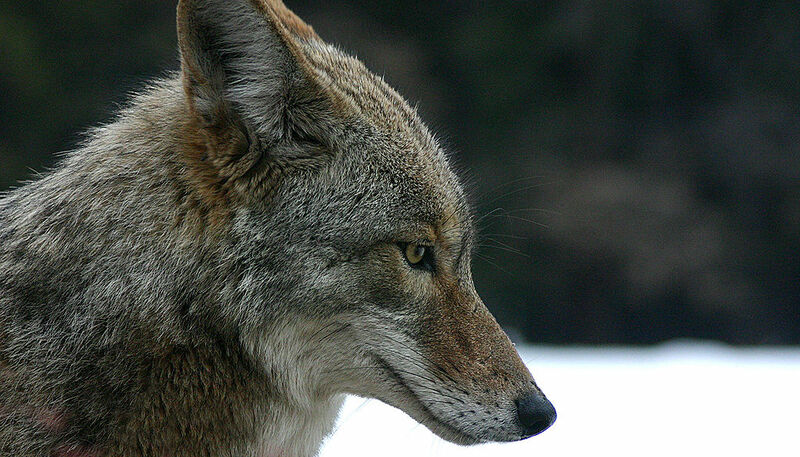 Look for more events to learn about coyotes, oak openings, and prescribed fire in 2016! (events will be posted soon). 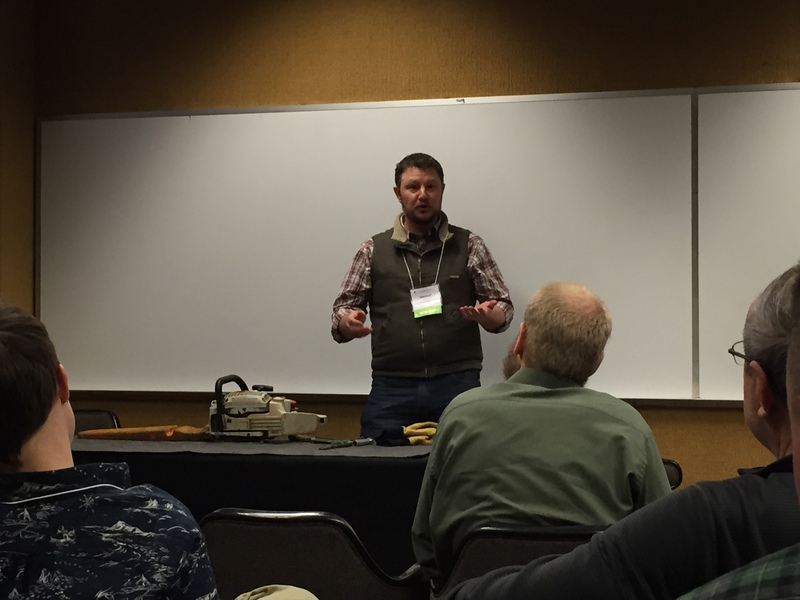 Mike Hahn of Natural Areas Preservation in Ann Arbor fills us in on the finer points of regular maintenance and field repair for chainsaws. 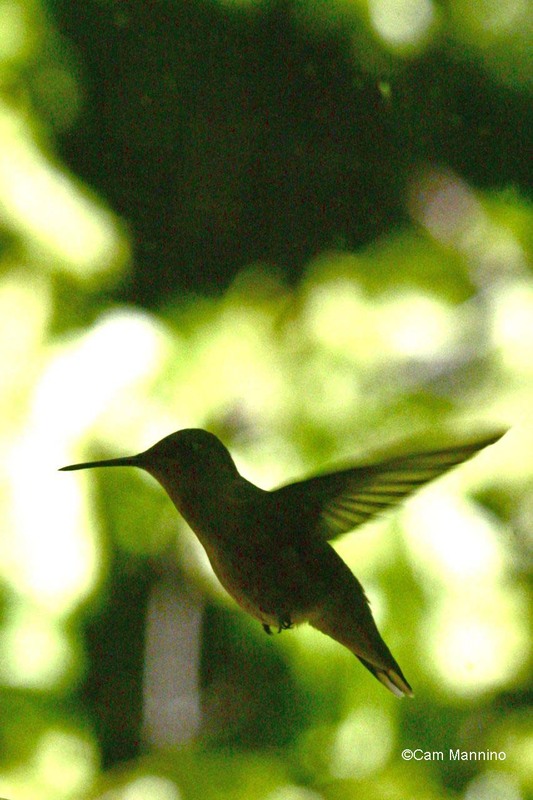 Cam Mannino joined us as a volunteer Park Steward early in 2015 and soon after began her weekly posts, “This Week at Bear Creek.” Each week Cam took us on a virtual tour of Bear Creek Nature Park, spirited along by her agile pen (well, keyboard) and insightful camera lens. I learned a lot about the insects, birds, and other critters that call Bear Creek home, and I hope you did too! Check out some favorite posts below. Do Birds Have Cold Feet? And Who Else is Under the Pond Ice? 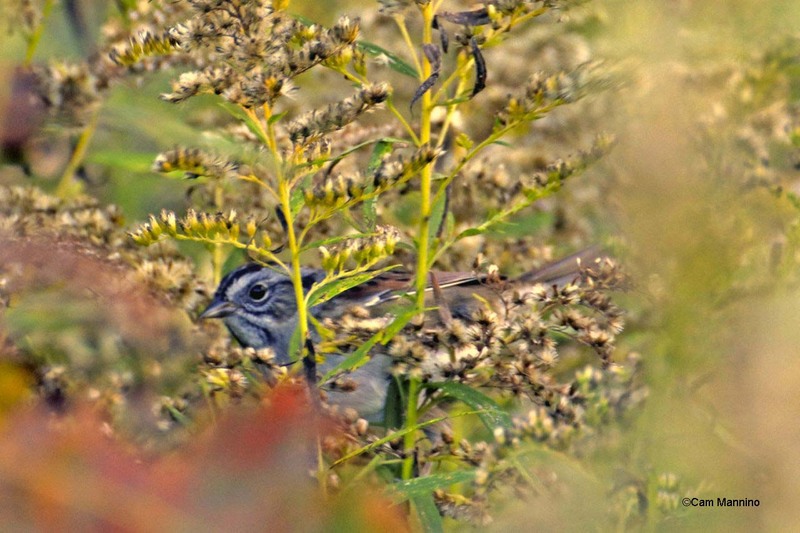 Punctuating nearly two years of preparation, we planted 38 acres of native wildflowers and grasses in prairie/oak barrens restoration areas at Charles Ilsley Park and Draper Twin Lake Park. Financial and technical assistance from the US Fish and Wildlife Service, through their Partners for Fish and Wildlife program, allowed us to complete this phase of our ambitious grassland restoration project. Be sure to visit these parks over the next few years to watch the grasslands mature. Look for more big habitat restoration projects at Charles Ilsley Park, Gallagher Creek Park, and Stony Creek Ravine Nature Park in 2016! It is amazing how easy it is to forget the little details (and even the important ones!). By taking time to carefully observe, thoughtfully reflect, and accurately summarize our stewardship work, we can refine and improve our work going forward. Happy New Year from the Stewardship Team!